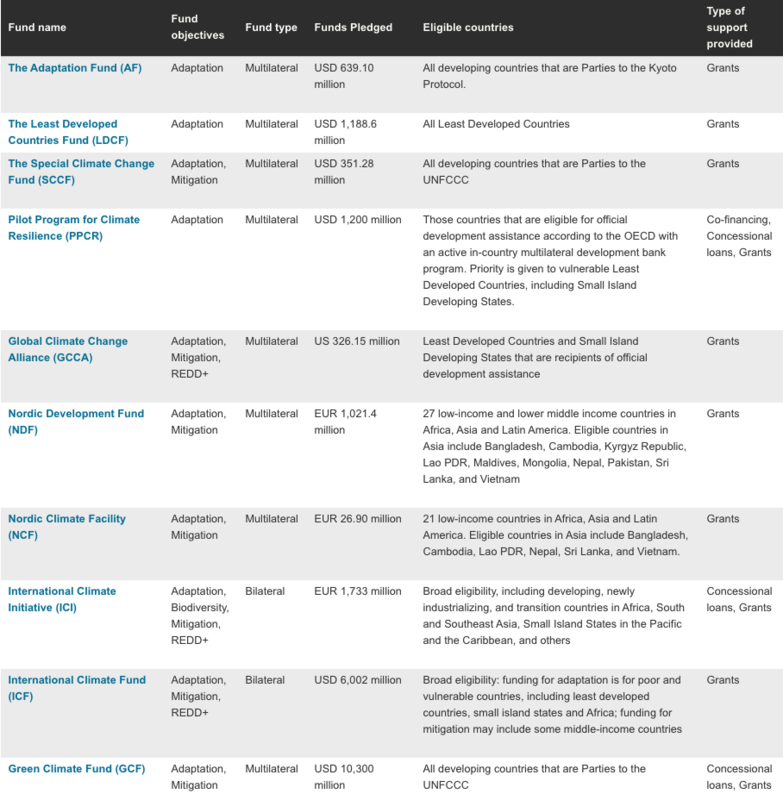 An 'at a glance' Quick Guide to Climate Change Adaptation Funds. Click to enlarge. The USAID Adapt Asia-Pacific Quick Guide to Climate Change Adaptation Funds is an easy to follow collection of 10 multilateral and bilateral climate funds and initiatives currently available for financing adaptation activities in developing countries. Unlike other guides that provide lengthier descriptions, we have presented here only the need-to-know, essential bits of information. This Quick Guide provides key facts about individual funds, such as eligibility criteria, target areas, and, importantly, the mechanisms that will ultimately help you gain access and approval. Developed by the USAID Adapt Asia-Pacific team of climate finance experts, the Quick Guide includes “Tips by USAID Adapt Asia-Pacific” with bite-size, handy information on how to get your projects funded. These tips are based on our on-ground experience working with country officials, implementing agencies and fund managers. An outline of the guide is provided below. Download the full Quick Guide from the right-hand column. This is the second publication in the USAID Adapt Asia-Pacific Adaptation Finance Knowledge Series. For related resources see the Further Resources section below. To date, money from these funds has been spent on a variety of sectors in Asia-Pacific, including disaster prevention, agriculture, coastal zones, water and sanitation, and infrastructure. International funds, however, provide only a piece of the adaptation financing puzzle. The current funding available does not meet the projected needs for adaptation in developing countries. Countries also need to mobilize the additional domestic and, especially, private sector funds. But while more financial resources are still needed, existing funds are an important resource, and this Quick Guide helps potential applicants understand the different funds available. Funded through USAID’s Regional Development Mission for Asia (USAID/RDMA) and implemented by AECOM, USAID Adapt Asia-Pacific was designed to share information and best practices about climate change adaptation finance modalities and project preparation tools and help governments build capacity to access the existing pool of international climate change adaptation funds. USAID Adapt Asia-Pacific (2017) Quick Guide to Climate Change Adaptation Funds. USAID Regional Development Mission for Asia: Bangkok, Thailand. USAID Adapt Asia-Pacific has been helping countries develop bankable adaptation projects and improve their access to funding. These experiences, published in this series, are based on our work with governments, multilateral and regional organizations, and other experts. This theme focuses on how to ensure that climate finance serves to achieve meaningful, long-term change in economic and social development trajectories, particularly for developing countries. Climate adaptation finance, a critical resource for developing countries, can sometimes be governed via national-level institutions that are disconnected from the contexts and needs of local people. Climate leaders must learn from existing work in other international regimes to ensure the effectiveness of capacity-building programs. This research brief calls for the development of robust reporting systems for climate finance in Latin America, through national capacity builidng and based on mutually-agreed priniciples. The USAID Adapt Asia-Pacific program shared information and best practices about climate fund requirements and helped governments build capacity to access climate change adaptation finance. This guide aims to assist government and non-government agencies at all scales in preparing bankable climate change adaptation proposals to access various sources of financing. This USAID Adapt Asia-Pacific Quick Guide is an easy to follow collection of 10 climate funds and initiatives available for financing adaptation activities in developing countries. Strengthening linkages between adaptation and the sustainable development agenda whilst enhancing institutional and research capacity.